Cooking, Cooking & Eating, Ingredients, etc. I haven’t decided what all vegetables we’ll be pickling, just yet. It depends largely on what looks fresh and seasonable at the end of next month. But you can expect that there will be some roots — carrots, turnips, radishes, or a combination thereof. You can expect cabbage and its delicious acerbic cousins. And maybe, if things go well, there will be some hot peppers, too. Because absent the spicy sting of education, you can hardly call it a class at all, right? Need some live active cultures in your diet? How about intense and flavorful food experiences that are also healthful and ecologically sound? Lacto-fermented vegetables like pickles, krauts, and kimchi are all of these things, and easy to make at home. Learn basic techniques for preserving vegetables and unlocking their nutrients. And at the end of the day, you’ll walk away with your own jar of pickles. 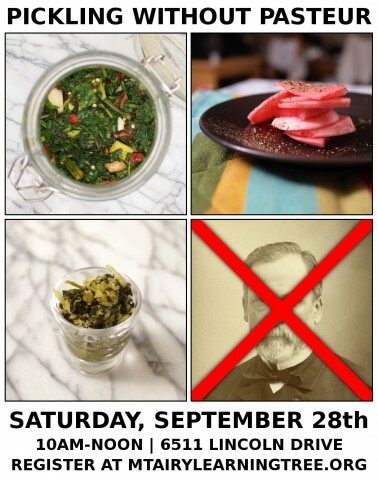 And like I said: Pickling Without Pasteur meets on Saturday, September 28th from 10 am to 12 pm, at the Unitarian Society of Germantown at 6511 Lincoln Drive. It costs $29.00 for the two-hour workshop, plus a $10.00 materials fee. Pre-registration is strongly recommended. And you can sign up here, through the Mount Airy Learning Tree’s website. Please come! And tell your friends to come, too!